I grew up with Muhammad Ali and “Smokin” Joe Frazier and George Foreman (the fighter, not the grill). Then there was Larry Homes and “Marvelous” Marvin Hagler and Oscar de la Hoya and Evander Holyfield and Tommy “Hit Man” Hears and of course, “Iron Mike” Tyson. But that was then, and this is now. And this very well may be the fight of this fifteen year old Century. Mayweather v. Pacquiao may well be the fight to end all fights – until the next big fight. It’s been a long time since there’s been a fight of this magnitude. Will it live up to the hype? Will it live down through the ages? 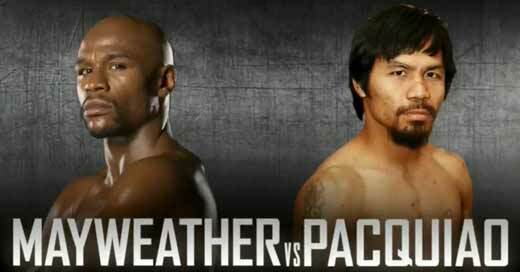 Will it be worth the $100 pay-per-view price? I won’t know because it won’t start till way past my bedtime. But this much is true: big fights don’t come around every day, and big fights are big in every way. Mayweather v. Pacquiao may well be bigger than anything that you face in your life every day. And maybe not. Maybe you have big fights and big games and big races and big heats and big matches and big Game 7’s in your life all of the time. God bless you. Because it takes something to get “up” for the big one. When it comes to the big fights in your life, it’s all about how you approach them. It’s all about your tactics and your techniques and your practices and your preparation. Because how you go in pretty much dictates how you will come out. If you don’t have an edge and an aura and tact and a tone and the dexterity and the delicacy to bob and weave and duck and dodge and juke and jab and as you fight in the ring of life, you’ve lost before you’ve even won. In the big fight of life, you can’t have a glass jaw. You can’t just stand there like a statue and get knocked in the nose and hammered in the head and gorged in the gut. You’ve gotta’ fight back. You’ve gotta’ fight fierce. You’ve gotta’ scrap and scrape and battle and brawl and get through every round until it’s all over. You may be sucker punched and rabbit punched and left punch drunk before you are saved by the bell. So who ya got? I don’t know the fighters well enough to call this one. But the pundits are predicting a whale of a fight. So go ahead. Pay your 100 bucks and tell me how it was. And make sure that you’re ready for your next big fight too.